I was in the "creating" mood, and had a ton of zucchini to use up. The result: "Cheesy" Zucchini Biscuits! 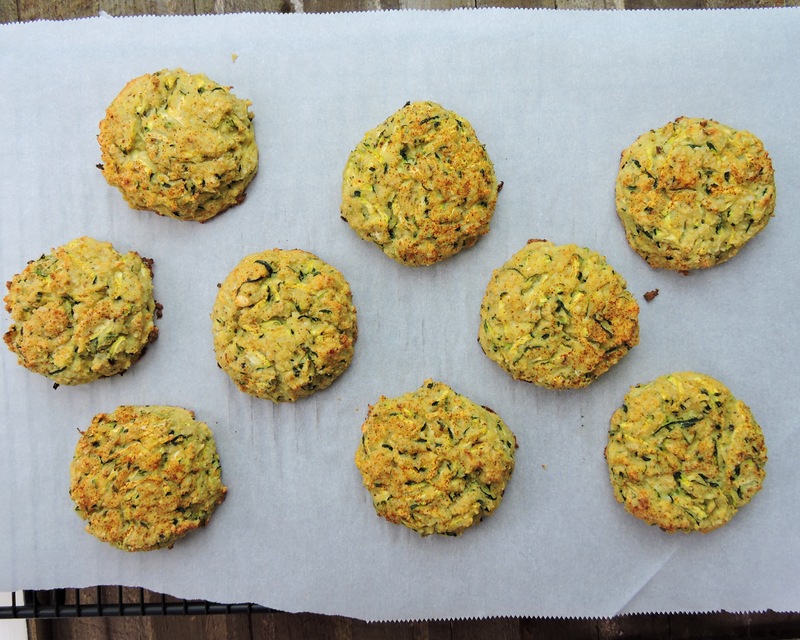 The inspiration for these was my most popular recipe to date (by far)... my Cauliflower Biscuits with Bacon & Jalapeño. But I was craving a different flavor element this time... something cheesy. A Paleo baby, that is. With Whole30 approved ingredients. & Speaking of Whole30... these technically would be considered "SWYPO" (see Whole30.com if you want clarification on that term) since they are a clean version of a non-Paleo food (biscuits). 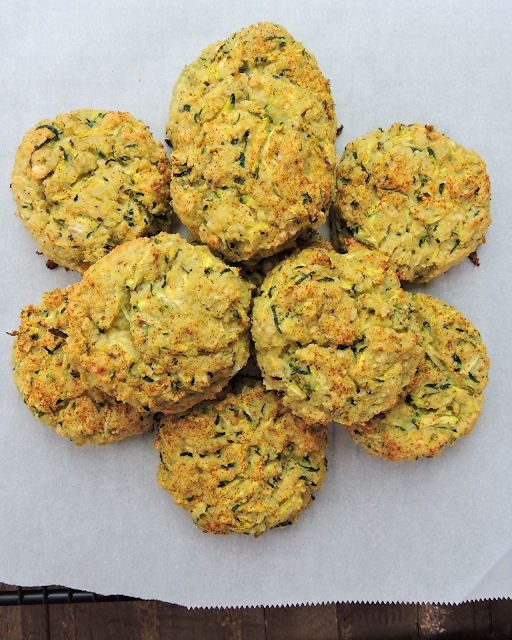 Try these served alongside meat & veggies, or dipped into your favorite soups. I think you are going to love them! Tag me in a photo on Instagram (@justJessieB) if you make them, and leave your review in the comments below. Hope you enjoy! Use the food processor with grating attachment to grate the zucchini. Set it aside in a bowl. Switch to the "S" blade, and pulse the cashews, water, apple cider vinegar, and spices (garlic, salt, pepper) until smooth. This is your "cashew cheese". Transfer the "cheese" to a large mixing bowl. Stir in 2 eggs, "whisking" with a fork until smooth. 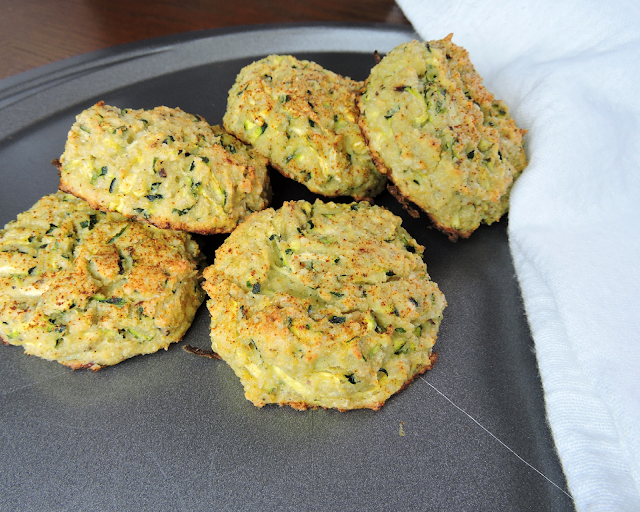 Stir in the coconut flour and grated zucchini until well combined. Add additional spices (salt, pepper, red pepper flakes) to taste. Line a baking sheet with parchment paper. Use a 1/4 cup measuring cup to scoop even amounts of the mixture, then tap it down firmly onto the sheet to make your biscuit shape. Press down lightly on the top of each biscuit to flatten the tops, and sprinkle them lightly with paprika. Bake for 25-30 minutes, or until firm & light golden on top. Transfer to a cooling rack, and allow to cool on the sheet for 5-10 minutes before serving. The zucchini I used were each around 7" long. Use whatever size you have~ as long as you end up with 3-4 cups of grated zucchini. Substitute lemon juice if you don't have any apple cider vinegar on hand. Try other mix-ins like chopped bacon, sun-dried tomatoes, or dried onion. 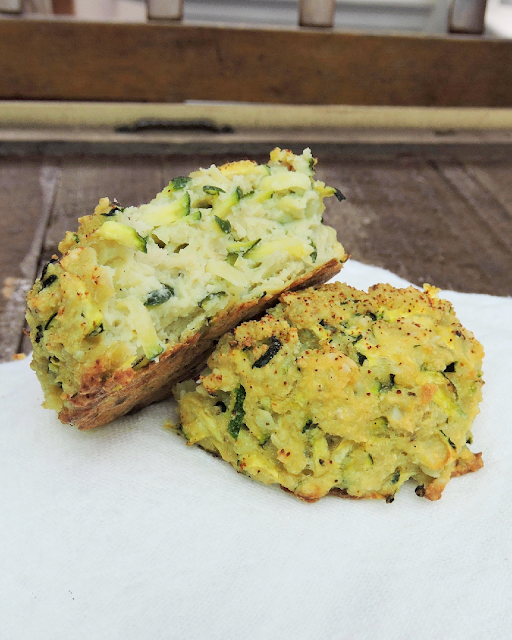 I just made the zucchini muffins and I love them!! I'm wondering if you have nutrition information for them as I'm trying to figure how many calories. Thank you! PS - I'm enjoying your blog and recipes ! Also, I grew up in Pleassnt Hill!! if you don't have a food processor, can you use a vitamix for the zucchini and/or cashews? Can you use almond butter as the "cheese"? I don't know if it would be possible, but it would be great to get carb & sodium counts.